So post your oldest 510 here. Support it with actual photos of the firewall stamping. As any seasoned 68 510 owners will know, the 68's (at least in my neck of the woods) didn't have VIN number plates on the door jamb stating the month of their build. Only the VIN# stamped in the firewall, and on a plate under the hood. The very late 68's got a VIN number on the dash, however the early ones may not have (no spot for them). 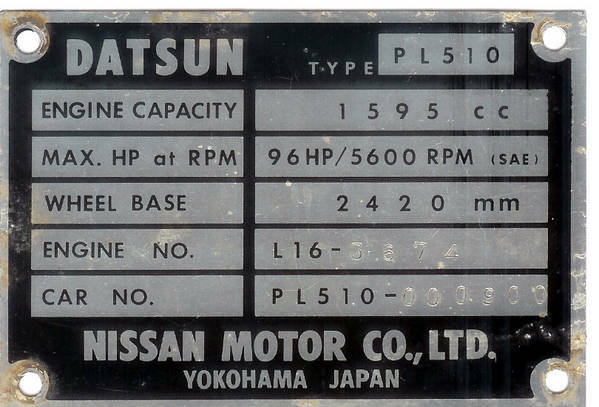 According to some information collected by UFO owners in the 80's, up to VIN# 40010 should be a 68 - let's collaborate this. I'd be really curious about the American cars, as the US market 68's were unique 2 or 4 drs cars (no one else got the 2 dr model in 68) - post any 68 510, lets see the range. If it had the opposing wipers, and the small tail lights, it's a 68. 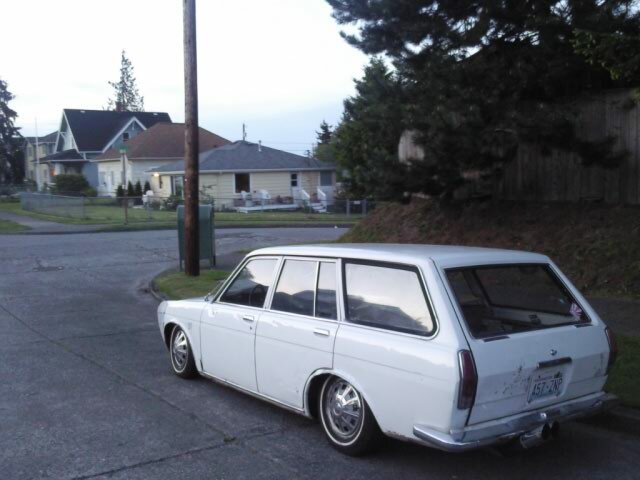 Also 68 wagons - Rich, you are likely the only 68 wagon owner locally, Jeff you had one - lets post the WPL numbers. So, post what you have, or have found. 000187 broke - NZ car but registered as a 1972 - very odd as hundreds of thousands would have been produced by then. Car has not been altered so maybe a different or separate numbering system. Is it possible that it's the 187'th car sold in NZ ? 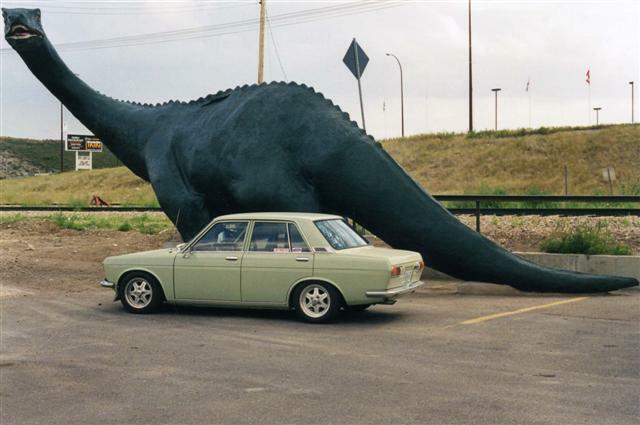 Here is a car I found in Chilliwack a couple years ago with Jason - we didn’t get to buy the car (we were out bid). It was pretty rusty, and its whereabouts is now unknown. So it may not qualify as a true existing car any more. The original owners card from Rotory Motors in Vancouver!!! She's not near as old, but still up there. This was my second 68, and was likely my favorite all time driving 510. I don't have records of the VIN in photos, but I was an original 4 speed car, I did a fairly good restoration on it. 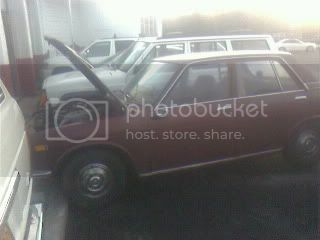 The car still survives up in the Sechelt area, but its condition is known as I have not seen the car in nearly 10 years. This was the nicest highway driving 510 I’ve ever built, and highway driving I did! Jasper National Park on a midsummer sunrise – about 4 am (it’s pretty far north for you southern types – summer days get long!. I was only 3 hours into a 14 hour drive home to Vancouver from Edmonton, but the skyline was gorgeous that morning. Low in the snow – I rolled it out to take this pic on the grass, then rolled it back into its nice heated garage! This car is sold now and last I heard on it’s way to California, but had belonged to Betty M of Vancouver – she was the original owner until earlier this year! It’s an original 4spd car, and a survivor at 39 000 original miles. 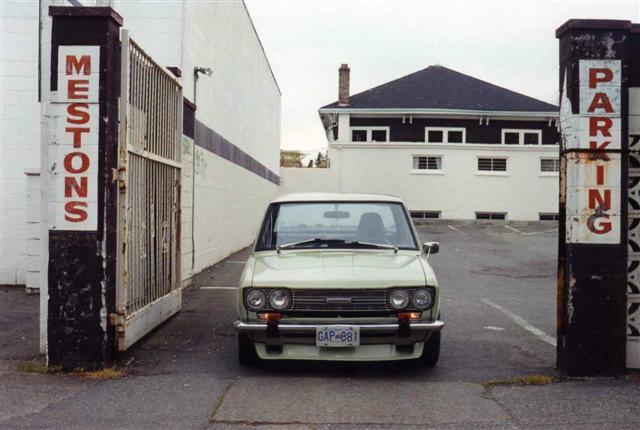 Brand new, taxes in - $2166 from White Spot Datsun in Vancouver! the yellow wagon hiding in chilliwack is WPL510 815309, and is currently registered as a 1969 1600. I believe the wagons started at 800000. Estimating, mine was made between May and July '68. The front seat belts in the car were made in each of those months - two different sets. The car only has the engraved VIN on the fire wall - no other plates or numbers anywhere. arriving home with the 'new' car! I don't have a pic of the vin but I will edit post at a later date and add it. It has the wrong hubcaps for the year but sure looks awesome! it's like number 1100 or something, the seatbelts say 67 on them. sorry no pic but i still have 000308 at home waiting for a major overhaul. it would make bad granny look like a calif car. At least parts of it live on in other 510s!